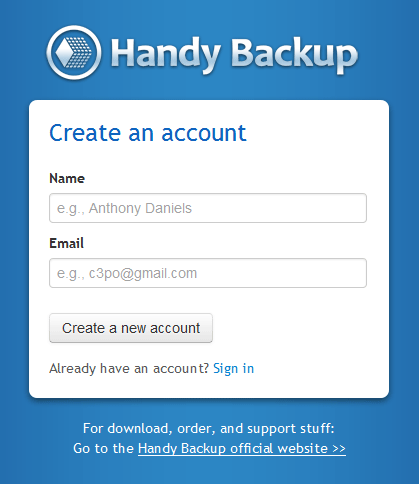 This chapter describes how to manage data backed up to HBDrive account. To learn about HBDrive and how to create an account, please refer to the previous chapter HBDrive (Online Storage Service). Enter your login and password, and then click . The application connects to HBDrive and displays data in your account. After logging into your account, you can browse and download files. The user interface consists of four main elements: Toolbar, Navigation Bar, Navigation & Details Pane, File Browser. You can learn about them below. Toolbar contains six buttons that are used to customize HBDrive interface and manage data. Left Pane. Hides or shows the Navigation & Details Pane. Display. Allows changing view of the File Browser. Download. Downloads a file selected in the File Browser. Rename. Allows renaming a file selected in the File Browser. Delete. Moves a file selected in the File Browser to a Recycle Bin. About. Displays information about HBDrive. If you are not logged in, the toolbar replaces File Browser controls with a Log in button that opens authorization dialog. The Navigation Bar displays your current position in the File Browser and lets you quickly navigate in the HBDrive file system. Scope Selection. At present, this menu has only one option My Files. In future, when we introduce an option of file sharing, it will also contain Shared Elements. Top button. Opens a parent folder in the File Browser. Path. Contains a path to the current folder opened in the File Browser. You can use this field to quickly go to a desired path in the HBDrive file system. Reload button. Refreshes contents of the current folder in the File Browser. Favorite button. 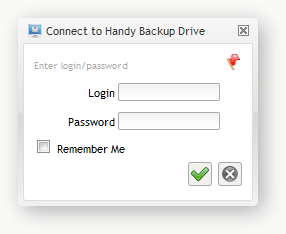 Allows creating a bookmark in the HBDrive file system. Bookmarks help you quickly go to a bookmarked folder. The Navigation & Details Pane contains two inner panes: Folders and Details. 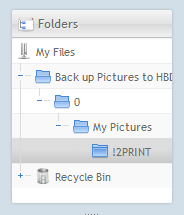 In the Folders pane, you can navigate through HBDrive folders. Selecting a folder displays its contents in the File Browser. The Details pane displays information about the folder selected in the Folders pane, or object (file or folder) selected in the File Browser. For files, it also displays file info and provides the Download command. 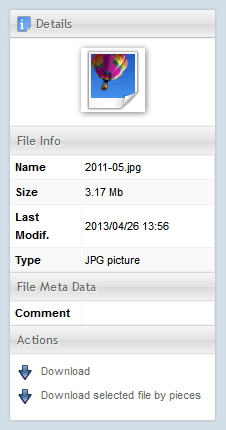 In the File Browser you can see all data that you have in your HBDrive account. At present, the file browser supports only two commands: Download and Delete. Select the desired file in the File Browser. Click the Download button in the Toolbar, or the Download command in the Actions section of the Details pane. Click Download selected file by pieces in the Details pane. In the Number of pieces field, enter a number of pieces to split the file into, and then click . The application displays links to the respective parts of the file. Click them to initiate the download. To delete a file or a folder from HBDrive, select it in the File Browser, and then click the Delete button in the Toolbar.